Waterton offers some of the best hiking trails, for almost anyone’s ability and preferences. Boating, scuba diving and board sailing are popular sports in Upper Waterton Lake. Rent boats at Cameron Lake. Waterton has an 18-hole golf course, horse riding stable, public tennis courts, ball field and playgrounds. In winter, cross-country skiing and snowshoeing are popular. Most services are located in the Waterton Park townsite. There are ten hotels, several restaurants and lounges, fuel stations, camping supplies, groceries, pool and spa, bank machines, gift shops, tennis courts and playgrounds. interpretive guides, bicycle rentals, golf course, boat tours on Upper Waterton Lake and canoe or rowboat rentals at Cameron Lake are also available. Waterton Lakes National Park is open year round. The peak visitor season is during July and August. If you are planning a trip to Waterton during these months, be sure to book your accommodation in advance. Please note, campground sites cannot be reserved. NOTE: From late fall to early spring, most park facilities are closed, and very few services are available in the village. Waterton’s summers are brief and cool with some hot spells (high 35*C/94*F). Winters are long and relatively mild, with frequent warm spells (high 10*C/50*F), often caused by chinooks. The park is one of Alberta’s warmest places in the winter, despite temperatures that can drop as low as -40*C.
Waterton’s climate is best summarized as mild, moist and windy, and its weather is always variable and quick to change. Wind – with an average daily velocity of 30 km/hr, is a noticeable and important element of the park’s climate. While gusts of over 100 km/hr (60 mph) are common in the fall and winter, gusts of over 150 km/hr (90 mph) have been recorded in the main valley. If you like sailboarding — this place is where you want to be…. 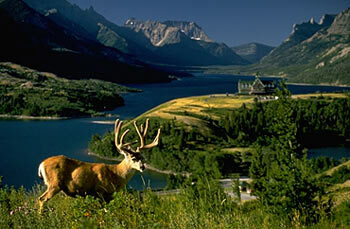 Waterton is a small piece of the international Crown of the Continent ecosystem. Its climate is strongly influenced by prevailing Pacific maritime weather systems. Warm, moist air flows over the Coast Mountains and Columbia Plateau before spilling across the narrowest point in the Rocky Mountain chain. This moist air often meets a less dominant weather system, the cold, dry Arctic Continental. When this cold Arctic air and warm Pacific air meet, the warmer air is forced up and creates ample snow or rain. As a result, the park receives Alberta’s highest average annual precipitation – 1072 cm (42 inches). This influence is also reflected in the big differences in moisture levels from west to east across the park. Cameron Lake, at the continental divide, receives an average of 152 cm (60 in) annually while further east, the townsite receives 107 cm (42 in) and the park gate receives only 76 cm (30 in)! 159 miles (264 km or approximately 3 hours drive) from Calgary, Alberta. 78 miles (130 km or approx. 1 hour, 15 minutes drive) southwest of Lethbridge, Alberta. 40 miles (60 km or approx. 34 hour drive) north of Glacier Park entrance at St. Mary, Montana. Airports at Calgary and Lethbridge, Alberta; Kalispell and Great Falls, Montana. Car rentals at these cities and Waterton. Open May 15- May 31: 9 a.m. – 6 p.m.
June 1 – Labour Day: 7 a.m. – 10 p.m.
Labour Day – Sept. 30: 9 a.m. – 6 p.m.